PRO-TIP: Share reports with your healthcare Team! BIG NEWS! 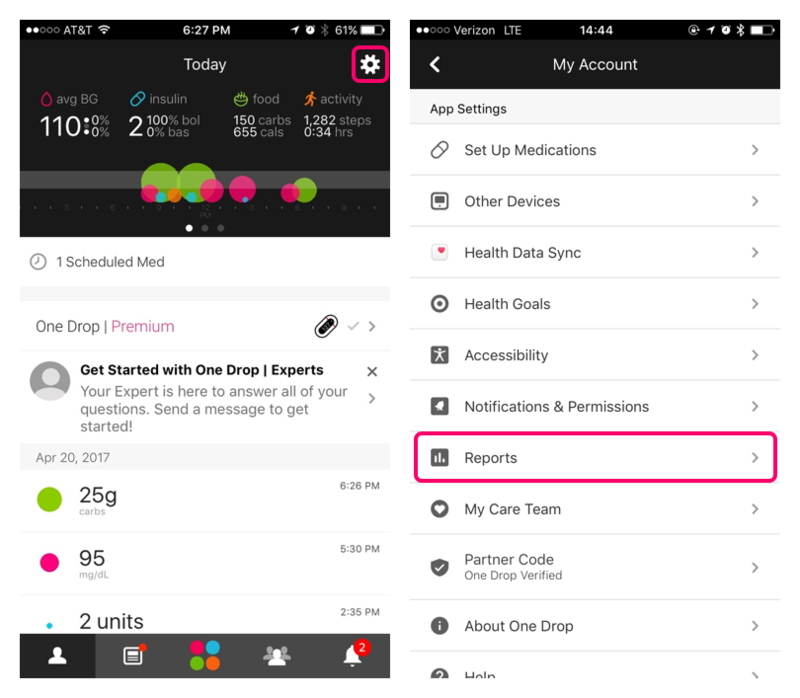 One Drop now includes improved reports! Find out how to use our new report features. 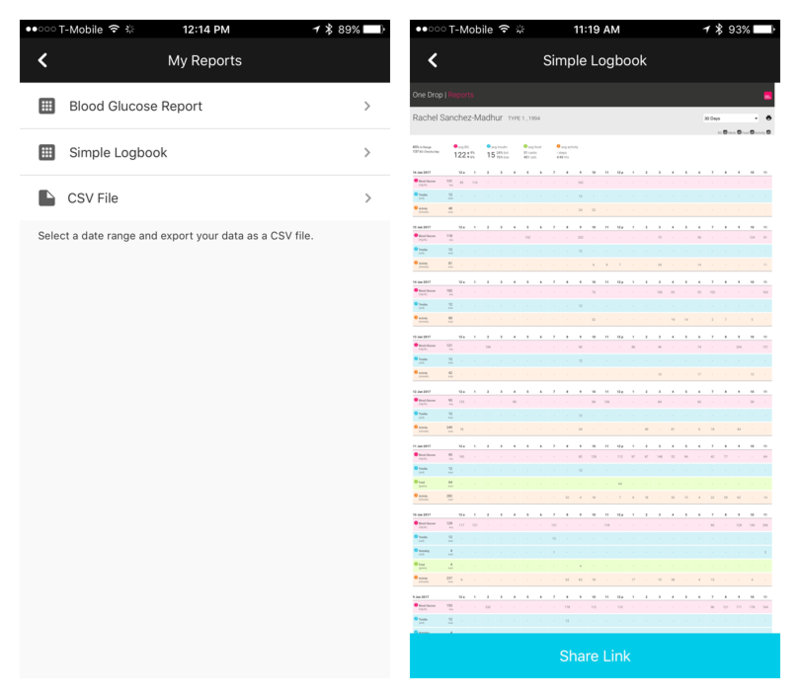 Take a look at your Blood Glucose Report by tapping "Blood Glucose Report" in the Reports menu. 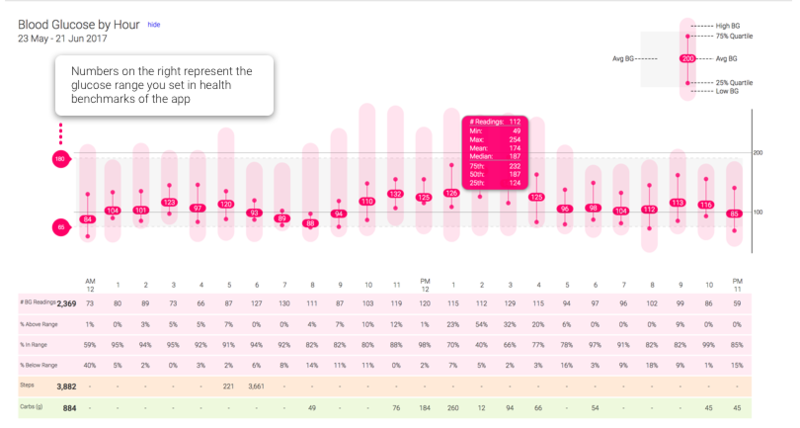 This report, meant to be viewed on a desktop, displays your blood glucose data for easy analysis. Simply share the link to your report to yourself or to a caregiver to view the data. 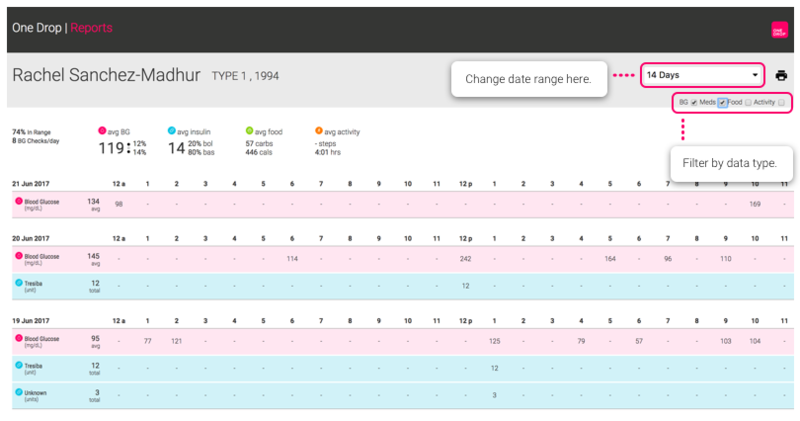 In the Blood Glucose report, you can view your blood glucose by hour and day. Change the time range in the top right corner to see your 7, 14, 30 and 90 day trends. The table below the graph also allows your to see your average steps and carb intake over the designated time span. Above the graph, you can see your A1c, weight and medication history to see where you started and how far you've come. You can set your range in the health goals in Settings, the default setting is 70 mg/dL - 130 mg/dL. Rachel was in-range 82% of the time at 8am, above her set range 4% of the time and below range 14% of the time. Spotting trends like a low 14% of the time at 8am, after a majority of steps in a day, can help Rachel modify her exercise routine and/or doses of insulin to prevent lows in the morning. The 75th percentile is the number that 75% of your blood glucose readings fall beneath. The 25th percentile is the number that 25% of your readings fall below or 75% of your readings are above. Take a look at your Simple Logbook by tapping "Simple Logbook" in the Reports menu. Like the Blood Glucose Report, this is meant to be viewed on a desktop. You can share the link with your healthcare team, family members, and friends. Your simple logbook shows you all of your moments by day and provides you daily averages. Use the moment type and time range filters at the top right to highlight the data you'd like to see. To use the moment type filters, click the box next to the type of moment(s) you would like to view or hide in your report. These filters make it easy to track how each moment type can affect another. Send all of your moments in a CSV file to your care team by simply selecting the time frame and your preferred delivery method. We make it easy to deliver your diabetes data to your doctors, spouse, friends, and family, just select your delivery method and send! Want to see these reports in action? >> More advanced reporting is also on the way — stay tuned!